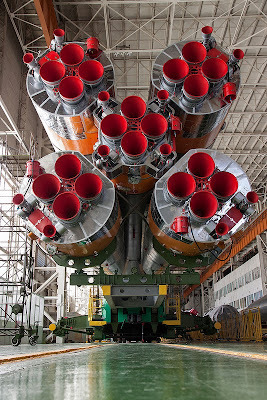 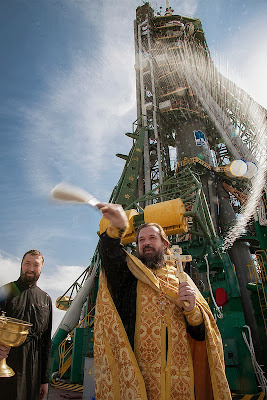 Boosters of Soyuz rocket, Expedition 37. A bouquet of red roses has long been a symbol of love and often proceeds cocktails or a fine wine. We think these almost three-dozen red nozzles on the boosters for the Soyuz rocket used in Expedition 37/38 to the International Space Station (ISS) are just as expressive and clearly symbolize the international cooperation involved in space travel. Launched from Baikonur Cosmodrome in Kazakhstan on September 25, 2013 the mission will deliver astronauts Oleg Kotov, Mike Hopkins, and Sergey Ryazanskiy to the ISS for a 6 month, multi-phase mission.